A short-ish interview with an Istanbul-based militant who has been active in the now nearly year old protest movement against Prime Minister Tayyip Erdogan and his AKP government. Anyone who's followed the situation in Turkey knew that although last summer’s demonstrations had died down by August, all it would take was a small spark to bring the masses back onto the streets. On March 11th the death of Berkin Elvan – a 14 year old boy who died after spending nearly nine months in a coma after being bit in the head with a tear gas canister last June – provided the spark that has breathed life back into the movement. In response, Tayyip Erdogan’s AKP government has continued its harsh repression of protesters. And now, with an election coming this week, the Turkish state has moved to ban Twitter across the country. To gain some perspective on this situation, Yusuf Cemal has kindly agreed to answer some questions about what’s happening on the ground. Yusuf is an IWW member based in the Besiktas neighborhood of Istanbul and has been involved in the protests since they first broke out in June of last year. What follows is a slightly edited transcript of an email conversation that took place over the weekend of 22nd and 23rd March. The latest news is that Erdogan has banned, or at least placed major restraints, on Twitter. Why has he done this? This banning is not related to protests against him directly. Erdogan fears something else. He doesn’t think that Gezi damaged his power. He doesn’t think that the 17th December corruption investigations damaged his power either. But his main source of power is his votes. The AKP and Erdogan have a huge power base and support in Anatolian part of Turkey, except in the Kurdish areas. These areas won’t change their opinions so quickly. Did Erdogan engage in corrupt and illegal activities? It’s not important for them. Did Erdogan order the police to kill protestors? It’s not important because, according to them, the protestors are terrorists. But these same groups have a deep religious concern for what they view as Islamic morality. And we think that there are videos which show Erdogan in some sort of compromising situation. Erdogan fears this information will get out before the upcoming local elections. The 17th December investigation is a crucial point. Gezi triggered the degradation of AKP. But the investigations broke the power block – Erdogan and his party, the AKP, versus an Islamist community which has power and influence in the judiciary and public services – Fethullah Gülen’s Cemaat. Fethullah Gülen lives in the US for now. Who has recorded this potentially damning evidence? It could have been Cemaat. But there is a lot of evidence of the US’ help to Cemaat. Erdogan is trying to highlight this although, of course, he can’t mention US directly. But it’s not important for now, because the voice recordings show us that Erdogan and the AKP created a kind of Islamist mafia state - fraudulent elections, extortion, cruelty, etc. You must hear the recordings, they are fantastic. As for the situation in Turkey more generally, the funeral of Berkin Elvan, a 14 year old shot by cops, was the biggest demonstration since the Gezi riots – it brought out more than a million people. However, the protests are dying down for now because of the election on March 30th. Everyone is focused on that. We are sure that AKP will try to rig the elections. And I’m sure that we must go out again after the election. In your opinion, what is the class content of the protests? Do you think the calls for "democracy" and "anti-corruption" reflect deeper class issues? How do you think this relates to the demographics of the protesters themselves? In Istanbul, protesters were especially white collar during the Gezi riots. Blue collar workers, especially non-organized workers, have been continuing to support Erdogan. But after the corruption investigations, this has started to change. There are even a few factory occupations. Not against Erdogan directly, but against Erdogan’s labour policies, specifically subcontractor issues. For example, there are 41 subcontractors in the Greif factory that is currently occupied by its workers. 41 different “firms” are in one factory. Can you imagine that? The bosses are using these divisions to ensure that workers remain unorganized. These same workers joined the latest round of demonstrations. This is a good sign. After the election, we will encounter an economic crisis. We think a white collar movement and blue collar occupations will erupt. Turkish flags and pictures of Kemal Ataturk have been a key theme in the movement. Why do you think this is? Do you think nationalism has increased or decreased in this latest round of demonstrations? We know his figure has been used by protestors in Anatolian cities such as the capital city of Ankara or in places like İzmir. But I never saw any pictures of Ataturk in Istanbul during Gezi riots from the protestors directly. After the cops’ invasion, the government did hang one picture on the AKM building [the Ataturk Cultural Center – CS] in Taksim near Gezi park. So we can’t say pictures of Ataturk have been a key theme in the movement for Istanbul. And this was the same during the most recent wave of demonstrations. But I understand your question. The Gezi riots were a breakthrough for the Turkish people. The riots changed the opinions of the people who were a part of the movement. Nationalist people shifted left a bit. So, for example, they had started to change their views regarding Kurdish people. But after Gezi riots finished, nationalism came back. Despite the last demonstrations, this nationalist spirit is increasing. For example, there is gossip: Cemaat has a voice recording or video which contains talks between Erdogan and PKK leader Ocalan who is in prison - maybe a negotiation. Even this possibility is enough to annoy nationalists. The opposition against Erdogan is trying to merge with the opposition against the Kurdish people. Some rightwing Kurdish politicians claim that “This is not an anti-corruption movement. This is a coup against Erdogan and the negotiations between Kurds and AKP”. This means “We are supporting Erdogan”. But the center of the Kurdish movement corrected these words quickly. But the nationalists are continuing to agitate Turkish people by saying “the Kurds support Erdogan”. What's been the role of the Left and organized anti-capitalist groups more generally? During the Gezi riots, the left was in the center of the movement. When people go out to protests, the anti-capitalist individuals and groups are in the front of clashes, as usual. But there are a lot of limits to such symbolic action. Cops can break demonstrations by using tear gases and bullets, the government can slight them, etc. The Left doesn’t understand the limits of symbolic action. We need direct action: picket lines, mass strikes, sabotage, etc. We need to use other methods. What's your opinion of the "General strikes" that have called by the Leftist union confederations to support the protesters? In Turkey, the word of “general strike” doesn’t mean a real general strike - just symbolic action that can not harm the enemies. The union confederations, not just the so-called “yellow unions”, don’t want to go out for a general strike. Also, they think, frankly, the workers don’t want to go out on strike. This is a myth. But we can not test it without a real general strike call. For example, for Berkin’s funeral, they tried to go strike for only two hours. We didn’t see any effect of this “strike”. A general strike can be and must be prepared. But both the Left and the unions are waiting for spontaneous mass strikes. How do the protests relate to the Kurdish situation within Turkey? Erdogan uses symbols which the Left created in the past: democracy, human rights, hate speech, etc. But he changes the meaning and the contexts slightly. Then, suddenly, they label you a fascist because you said that Islam is bad for women. So, if we aren’t be able to get rid of Erdogan, 2015 will be the most important election in the history of Turkey and Kurdistan. The protests in June led to the formation of community "forums". Are they still active? Were they effective? These forums are not effective for now. The main problem was the “election”. They didn’t develop any target and they were stuck discussing the election. “We should vote for the biggest rival of AKP” “We should boycott the election” “We should vote for Kurdish movement” etc. This August there will be a presidential election in Turkey. How do you think the political establishment will relate to the protest movement? What can we expect from the AKP and the CHP? The president of the republic is not an important person. He or she (is it possible?) cannot determine anything. He can block law changes for a little while. Erdogan wanted to arrange a real presidential system. A president who can make every decision – not just the symbolic type. But after Gezi, it’s impossible. AKP didn’t manage to make laws about that. So, as I said above, the general election in 2015 is incredibly important. We need direct action: picket lines, mass strikes, sabotage, etc. We need to use other methods. Today a ten years old boy who was hit on his head by tear gas canister fired by police in Diyarbakır - Kurdish area in Turkey. 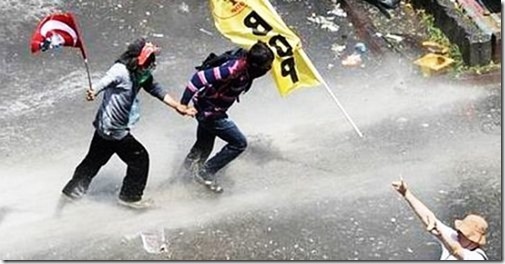 Cops had attacked people on streets after a legal BDP - Kurdish party meeting for a show of force. The cop had targeted kid's head within 5 meters on purpose as eye-witnesses said. They use tear gas canister as a lethal weapon as usual. I don't even know what that means! "But I never saw any pictures of Ataturk in Istanbul during Gezi riots from the protestors directly". this is simply not true. i've been in gezi during the protests half of the time and there were ataturk's posters, turkish flags etc. a lot. that is to say i would predict %50 of the protesters to be ataturk sympathizers. bur for sure core of the movement is not republican (i.e cumhuriyetci, ataturkists). we should not oversee the facts. otherwise, analysis and conclusions will be incorrect. Yes, I'd have to agree with the above poster. I haven't been in Istanbul, or Turkey since just before these protests began, but I have watched Turkish TV and they are certainly there. Incidentally I am not 100% sure, but I think in the image at the top, the protestor is holding a Turkish flag with a picture of Mustafa Kemal on it. It is not absolutely clear, but I think that is what it shows. Turkish flags yes there are. Maybe Ataturk pictures was used after clashes by some protestors. But at first stage of clashes, there are only Turkish and left party flags as I remember. On 1st June, after cops drew back, nationalist CHP came to Gezi with flags and probably posters. And during the days we occupied Gezi, only one big group got Turkish flags hands on. 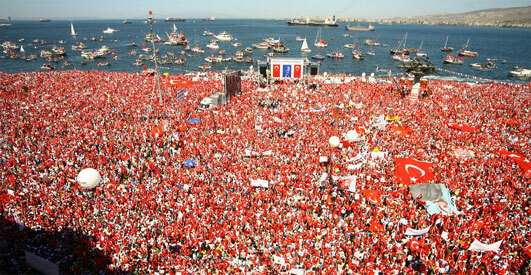 But I think you never seen any nationalist demonstration in Turkey. Turkish flags and Ataturk pictures are used too vast in this type demonstrations. Would you take a look in these pictures I attached? They were from Republic Meetings in 2007 against AKP. You can see real usage of Turkish flags and Ataturk pictures. This doesn't mean there is no nationalist in Gezi park. What I said was nationalism started to grow up again after Gezi. So we should not oversee the facts. I think Yusuf Cemal is spot on. In gezi hundreds of thousands of young people, who were mainly apolitical, and some of whom were probably coming from kemalist families came out to participate in an open defiance against the state. However, many of those probably considered kemalism as a "left" ideology. Years of opposition made kemalism look like a critical-left party and the youth clearly knows kemalism of Ecevit (who transformed CHP into a center-left/nationalist social democrat party) better than the original party of 1930s. This may be unusual for a westerner, because in the west bourgeois left -especially after WWII- could have an independent existence. However, in countries like Turkey the social democratic or liberal types were forced to merge with a hegemonic state-party in a system, which more or less persecuted every form of left opposition. Only extreme right groups traditionally had the liberty to enjoy freedom of propaganda without systematic harassment or outright state violence. This created the myth that Kemalism is actually left - since many who would otherwise be in a properly treacherous social democratic party was (and still is) in the Kemalist Party. And also there is still a strong sense that left should be statist and secularist (in a bourgeois sense) in Turkey - a myth which the radical left also helped to create in 1960s and 1970s. That is why radical left was respected and could easily become the hegemonic force in Gezi. Because, radical leftist people (which included a wide spectrum of groups ranging from feminists to ML types) was the most organized ones, fighting most decisively both on the initial barricades and later on in the main square. Kemalist kids basically either sympathized, respected or tolerated that. The strange thing about this feeling of communality is that it is silently communistic without actually forcing people to give up their established sectarian mentalities. It is almost like a magical truce in which people to let themselves enjoy an egalitarian solidarity and community, a temporary halt in cultural antagonisms.